Berlinica Publishing LLC, 9781935902256, 96pp. 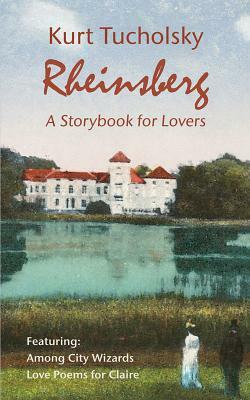 One summer before World War I, a young couple escapes on a romantic weekend getaway to the small German town of Rheinsberg, north of Berlin, in the midst of a rural landscape filled with country houses and castles, cobble-stone streets, lush forests, and dreamy lakes. The story of Wolfie and Claire, told with a fresh, new style of ironic humor, became Kurt Tucholsky’s first literary success and the blueprint for love for an entire generation. This edition features an afterword by Dr. Peter Boethig, the director of the Kurt Tucholsky Museum in Rheinsberg. Kurt Tucholsky was a brilliant satirist, poet, storyteller, lyricist, pacifist, and democrat; a fighter, ladies' man, reporter, and early warner against the Nazis who hated and loathed him and drove him out of Germany after his books were burned in 1933. The New York Times hailed him as "one of the most brilliant writers of republican Germany. He was a poet as well as a critic and was so versatile that he used five or six pen names. As Peter Panter, he was an outstanding essayist who at one time wrote topical sketches in the Vossische Zeitung, which ceased to appear under the Nazi regime; as Theobald Tiger, he wrote satirical poems that were frequently interpreted by popular actors in vaudeville and cabartes, and as Ignatz Wrobel, he contributed regularly to the Weltbuhne, an independent weekly that was one of the first publications prohibited by the Hitler government." Tucholsky, who occupied the center stage in the tumultuous political and cultural world of 1920s Berlin, still emerges as an astonishingly contemporary figure. Cindy Opitz is a translator and art historian who has translated numerous works by Kurt Tucholsky, including Berlin! Berlin! Dispatches From the Weimar Republic, and other authors. She is the collections manager at the Museum of Natural History in Iowa City. She lives in Iowa City, Iowa.